We offer riding lessons for beginners through to experienced riders. Children can now start at the age of 3 years old on our "Tiny Tots" rides, the sessions last for 20 mins, from the age of 4 children can progress onto half hour classes in the arena. As the children's skills improve they will be able to move onto the next stage of lessons. These lessons work through the ABRS riding and stable management tests. As your child progresses we also learn how to canter, jump, play horse ball and gymkhana games, hacking out and do a wide range of extra activities. Adults are welcome to join our group lessons, book a private or semi private lesson or book onto a hack. We have a range of "safe" horses for hacking out. We are constantly getting new adult riders from the ages of 18 to 80. 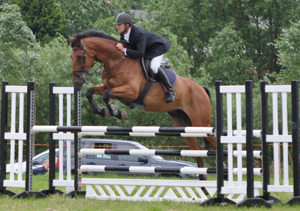 We offer lots for you to take part in such as stable management, entering competitions, part-loaning a horse, pub rides in summer or even if you just want to come and sit on a horse for a slow walk around we will cater for your needs. Remember..You are never too old to start horse riding !!! Maximum weight 14 stone. Pony days – These are 10:15am until 3:00pm. The children arrive in the morning and spend the day learning to care for a pony as well as having two riding sessions. Pony camps - A real favorite of our young riders. We have 3 different camps over the summer holidays to suit all ages and standards. The children sleep here with full supervision and enjoy riding during the day. The evenings are spent watching demonstrations, playing games and practicing dressage for show day. Own a pony days these are for more experienced children. The riders should be able to tack up and walk, trot and canter independantlyOne and a half hours supervised riding is included. There are many other riding activities for children to enjoy - contact a member of staff for details. Pony Parties –with up to 10 (children or Adults!) Learn to ride. Play games on the ponies. Rosettes for all the party children. £16.00 per pony per hour. 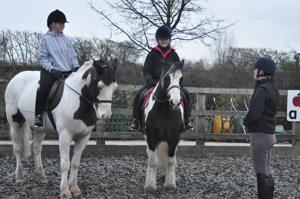 (Over six riders) £11.50 per pony per ½ hour (Over six riders). Under six riders will be charged normal lesson rates (please see our price list). We also have a Function Room available for hire (includes table, chairs and use of Kitchen) £20 per hour. The riders need to wear long flexible trousers and shoes with a flat sole and a small heel, preferable not trainers or slip on shoes. Beginner children will need leaders, if possible could you please bring sufficient adults who are happy to assist and confident with horses, they will need to wear appropriate footwear [high heels and flip flops are not ideal]]. We may be able to supply some leaders from the stables if you are having difficulty. We are able to supply more instructors to help at an additional cost. Please pay a deposit 4 weeks in advance with confirmation of numbers and full payment one week in advance.